Learn all about the various types of awnings along with the latest info on installation techniques, proper sizing, selection type, and more. Have you ever dreamed of having your own shade pergola but realized that a traditional pergola provides neither shade nor rain protection? There is an alternative! Our collection of Custom-Built Motorized Aluminum Pergolas will give you decades of maintenance-free shade and rain protection. Notice in these two photos the beautiful look of the pergola in the open position (above) and the full shade and rain stopping power in the closed position (below). An Aluminum Pergola looks nearly identical to a wood structure except that it does not rot over time or require constant re-painting maintenance. Aluminum is naturally rust-proof and the powder coated finish on our Pergolas will last many times longer than paint on wood. Powder Coat is naturally smooth and tends to repel dirt where regular paint would absorb it. Also, the finish on our Aluminum Pergolas does not absorb moisture which allows the materials below to be truly protected. At West Coast Awnings, we have more than 50 years experience installing metal and fabric structures in Tampa Bay. Because we know what works and what doesn't, we use only Stainless Steel Hardware in our exterior projects so you don't have to worry about corrosion destroying your Pergola addition prematurely. It is true that Stainless Steel hardware is many times more expensive than basic steel hardware, but we believe in doing a job once and doing it well. You can trust your Motorized Pergola Project to us because we are experts in the industry and experts in building in Tampa Bay. Give us a call today to find out more! Restaurants and other food and beverage service businesses with an outdoor seating area can benefit from an awning or other cover simply for the seating turn-over. One afternoon thunderstorm can wipe out an entire dinner-time rush. 30 minutes of rain and all of those seats sit empty and your restaurant loses all those tables. Also, in the heat of the summer, the sun can make your outdoor seating area unusable. Some restaurant managers try to employ umbrellas, which really only put one or two people at a 4-top in the shade. Alternately, during winter, a cold breeze can make your outdoor seating useless. With a set of roll-down curtains around your awning, the cold wind can be stopped and the outdoor seating that you value can be used all evening! Obviously, adding an awning has done wonders for this Applebee's restaurant. You can see in the photo that the tables are protected from both the sun and the rain. In winter, when needed, the roll-down curtains will be dropped and secured to stop the cold wind. Wouldn't your restaurant do more business if you could seat your outdoor area in all weather? If you don't have an outdoor seating area you should consider adding one. It will likely pay for itself in only a few months and then you can increase your profits for years to come. You can also add heaters and lights to the underside of the awning frame for the added comfort of your guests. Using electric infrared heaters is especially economical when compared to propane heaters whose warming heat can be easily carried away by the slightest breeze. When combined with proper lighting, your restaurant outdoor dining area can be as comfortable as your interior dining room and send your revenues up in all seasons. With our custom-made welded aluminum subframe awning, you will have an area that is designed specifically for your area and adds both functionality and beauty to your establishment. Give us a call here at West Coast Awnings to see what we can do for you. You can check out our commercial awnings page for more info as well. The graphic above shows a few of the basic shapes and designs we can build for our customers all over Tampa Bay. Custom built awnings are a must in Dunedin where the Building Department is diligent about keeping the quaint beauty and architectural integrity of Dunedin intact for decades to come. If you live in zip code 34698, you know that the city only allows the highest quality and most beautifully designed structures to be built anywhere within the city limits. At West Coast Awnings, we've been working closely with the City of Dunedin for over 5 decades. If you need a shade structure, awning, or canopy built anywhere in the area, you need a local company that understands the intricacies of the Florida Buildling Code to get your project done the right way. Our awnings are made with the highest quality aluminum alloys and the longest lasting acrylic canvas fabrics available on the international market today. Our Sunbrella canvas has proudly served in the awning and marine industries for many years and has proven to be the gold standard for outdoor fabric today. As you can see in the graphic above, we offer many basic shapes to start off your awning project, but our real talent lies in our ability to custom build nearly any shape or style that you could imagine. Our skilled fabrication staff has over a century of combined experience and can squeeze the most imagination into an awning of any company in and around Dunedin. Check out the links above in our menu to take a look around our website and pay a visit to our Galleries to see some photos of projects we've completed recently. You will not be disappointed. 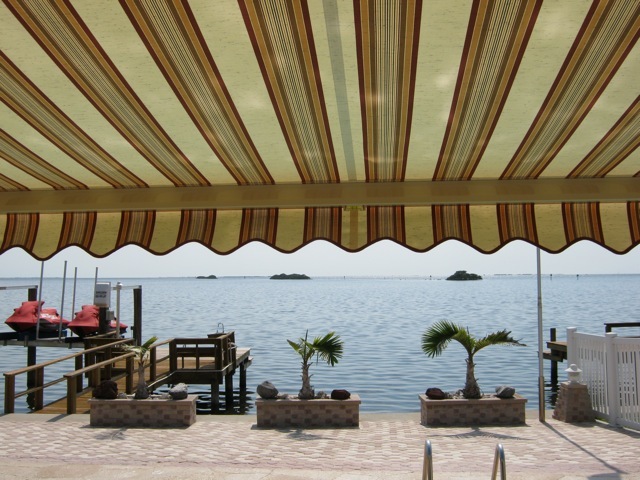 If you are looking for local owned and operated awning company in Clearwater, you've come to the right place. West Coast Awnings has been designing, manufacturing, and installing custom awnings and canopies of nearly every type since 1957. Our expert awning craftsmen and women make their homes right here in Clearwater and take pride in providing the highest quality products and services to our friends and neighbors. We all love Clearwater and Florida in general for the ample supply of sun, but sometimes that sun can cause some problems. Our awnings and canopies provide shade protection to lower interior temperatures, protect furnshings from fading, allow outdoor living spaces to be used even in the summer heat, and many other benefits. We would love the opportunity to meet with you to discuss the details of your project. No two projects are identical, so we take the time to see your site and discuss the best solution to fit your needs. Our on-site consultations are FREE and you have no obligation to purchase at any time. For our Customers in Belleair and Belleair Beach, our custom built awnings and canopies are the perfect solution to your shade and weather protection problems. To see our collection of Canvas Awnings, Canvas Patio Canopies, Retractable Awnings, Retractable Screens, and more, use the Menu Bar at the top of the screen to get more info or check out our Galleries to see photos of our work and examples of the types of products we have available. A stationary awning is a great way to cover an outdoor living space year-round to protect not only from the sun but also from adverse weather. Patio awnings, Porch canopies, and Lanai covers are essential to get the most out of your backyard areas from January to December. Given the drastic changes in Belleair weather from summer thunderstorms changing to sweltering sunlight, a canvas or insulated awning or canopy is the right choice for Belleair Beach residents. We have the expertise and experience to help make your Belleair Backyard the outdoor oasis of comfort and enjoyment you've always wished it would be. Give us a call today to find out how we can help you! In general, an awning or canopy can take an outdoor area that would be otherwise useless during hot summer days or during rain storms and turns it into an outdoor oasis that you can enjoy year 'round. Specifically, in the Tampa Bay area, many homes and business were purchased with an outdoor area as a main feature. Not being able to use this area turns a great investment into unrealized potential. Do something about it and take back your outdoor living area!! When designing and building a new metal shade awning, many factors must be taken into account. Not the least of which is the environmental impact that the product will have. Our Aluminum Architectural Awnings are made from 100% Recyclable extruded aluminum. Many years from now when the awnings are removed or the buildling demolished, these aluminum awnings can be reused to make many different aluminum products. When making a product like these aluminum awnings, it is not just important to think about the impact today, but also the impact on tomorrow. Additionally, our all-aluminum construction will never rust. While it will oxidize, the outer layer of aluminum oxide that forms on unfinished awnings is actually harder and tougher than the orginal aluminum surface which means that it will not flake away to expose fresh material underneath like rust on iron or steel. This choice of material while initially more expensive pound-for-pound is actually a better value due to the extreme longevity of the awnings even in salty environments like Tampa, Clearwater, or St Petersburg. Additionally, West Coast Awnings has a history dating back to 1957 of designing, manufacturing, and installing these types of awnings and canopies. While fabric awnings are beautiful and colorful, metal aluminum awnings are practically indestructible. Made from 100% extruded aluminum, these awnings will never rust, providing decades of shade and rain protection to doors, windows, or patios. Also, their powder coated finish allows these architectural awnings to match any style or color scheme that an architect or designer can imagine. Additionally, their custom built nature assures a perfect fit every time. For more information, contact us using the phone number above or our handy Contact Us form. Our engineering team loves to make your vision a reality. Whether you are shading a window to cool your living room or you need an awning to cover your pavered pool deck, we can find the shape, color, and method to fit your needs. We've been creating beautiful shade structures for over 50 years and would love to chance to talk with you about what we can do for you. Our business is based on keeping promises and making dreams come true for our customers. If you need a shade solution or a way to keep the rain and wind out of your patio or lanai, we are the people you should talk to first! In fact, talk to us first then talk to anyone else you want to. Usually, we end up being the last people you talk to when you say, 'thanks for doing a great job!" We got into the awning business to build fantastic structures for you, our client, and we'll be in the business for years to come for the same reason! Give us a call today to find out more!! Aluminum clamshell awnings in Dunedin are built from alumium which never rusts and have powder coat finish that is much stronger than standard paint. We only use Stainless Steel hardware in our installations around Dunedin. This means that the anchors will last much longer than conventional steel anchors. When dirt or debris settle on the awning, a simple hose wash is usually sufficient to restore the factory new look. Fold down awnings such as this one can be folded down against the window to protect it from thunder storms and for added security against intruders. Using the links at the top of the page, navigate through our product listings to find the awning or shade that is right for you. Or, give us a call at the number above to schedule a FREE consultation with an awning expert today! You can also click here to find out more information about our clamshell awning products and our ability to provide the best awning and canopy products available in Tampa Bay. Whether you live in a 20,000 sq ft mansion or a manufactured home near the water, we have the right product to shade your windows and provide security and protection from storms while you are away. You will not be disappointed. We are proud to offer a wide variety of retractable awning solutions for our customers in the Largo, FL area. Utilizing 9-ounce acrylic fabric with a 10-year warranty against fade, mold, rot, and mildew. Available in nearly 200 colors and patterns, the fabrics are also breathable to allow stifling heat to escape. Our retractable awning frames are built very tough with fantastic warranties ranging from 5 to 15 years! Our Largo retractable awnings are built CUSTOM to fit your home, but can be installed only a few days after receiving your order. Despite custom building every retractable awning in Largo from scratch, we can manufacture your awning and have it installed on your home in less than 2 weeks! During periods of heavy rains and strong winds, our exclusive retractable awnings roll-up tight against your home to protect from hurting the fabric or frame components. While retractable awnings are great for shading and protecting from a light rain, they should never be left out unattended as sudden wind gusts or rain can damage the awning. For more details, download our simple and helpful retractable awning brochures below. Each unit has different features available and differs in warranty length and available sizes. Give us a call at the number above so we can tell you more about our selection of Retractable Awnings. We would like to offer you a Free on-site consultation to help you decide if a Retractable Awning is right for you. We are excited to offer a wide variety of retractable awnings for your deck, patio, or other outside living space. Our retractable awnings in Dunedin use 9-ounce acrylic canvas fabric with a full 10-year warranty against fade, mold, rot, and mildew. Available in almost 200 colors and patterns, the fabrics are also breathable to allow heat to escape. Our retractable awning frames are built tough with warranties ranging from 5 to 15 years! Our Dunedin retractable awnings are built CUSTOM to the fraction of an inch to fit your home. Despite custom building every retractable awning in Dunedin from scratch, we can manufacture your awning and have it installed on your home in less than 2 weeks! During periods of higher winds and heavy rains, retractable awnings roll-up against your home to protect from damaging the fabric or frame components. One of the most common additions to any home in and around Largo, FL is a window awning. Awnings block the sun and shade the interior of the home which lowers Air Conditioning costs and protects indoor furnishings from UV fade. There are many more good reasons to have an awning over your window, but you probably already know them since you're here looking for information about awnings for your windows right now! The example shown here was just installed on the Grant family's home in Largo. This type of aluminum fold-down awning can be used as a storm shutter or security shutter when folded flat against the window. The all-aluminum construction means it will never rust, so you can expect many years of faithful service from an aluminum clamshell awning even in the harsh Largo, FL sun. Also, the support arms are adjustable to allow for different pitch angles which allows the user to set the awning at the perfect slant to block the sun most effectively. These awnings have been around for years and we've found a perfect balance between cost and strength! These awnings are very affordable and are custom built to the width and projection necessary to cover each window. They are manufactured right here in Clearwater from the highest quality materials available. At West Coast Awnings, we've been installing aluminum window awnings for over 50 years and would like to help you with your window awning project. Give us a call today to schedule a free on-site consultation. Have you ever dreamed of having your own shade pergola but were convinced that the maintenance of a wood structure would be too costly? There is an alternative! Our collection of Custom-Built Aluminum Pergolas will give you decades of maintenance-free shade with the classic look and feel of a beautiful shade pergola. Take a look at this prime example from Staybridge Suites in St Petersburg, FL. An Aluminum Pergola looks nearly identical to a wood structure except that it does not break down over time. Aluminum is naturally rust-proof and the powder coated finish on our Pergolas will last many times longer than paint on wood. Powder Coat is naturally smooth and tends to repel dirt where regular paint would absorb it. Also, the finish on our Aluminum Pergolas does not absorb moisture which allows the materials below to be truly protected. At West Coast Awnings, we have more than 50 years experience installing metal and fabric structures in Tampa Bay. Because we know what works and what doesn't, we use only Stainless Steel Hardware in our exterior projects so you don't have to worry about corrosion destroying your Pergola addition prematurely. It is true that Stainless Steel hardware is many times more expensive than standard steel hardware, but we believe in doing a job once and doing it well. You can trust your Aluminum Project to us because we are experts in the industry and experts in building in Tampa Bay. Give us a call today to find out more! West Coast Awnings has over 50 Years Experience in Design, Fabrication, and Installatin of Metal Louvered Sun Shades. We would like the opportunity to discuss your project to see if our sun shade products would be a good fit for you. The best way to find out more is to give us a call at 727-447-3461 to talk to one of our design consultants who can give you the details on the different options you have for shading your window, doorway, or outdoor living space. We have a wide variety of metal sun shade products that can be customized to fit the exact shape and style that you are looking for. We fabricate your awning from scratch from raw aluminum and then add the exact powder coat finish that fits best with your color scheme. We have a passion for building truly original products that are not cost-prohibitive but still have the custom built look and feel that we all appreciate. We look forward to hearing about your project soon! This week in St Petersburg, we had the opportunity to outfit this new retail location with window awnings to shade the interior, keep cooling costs down, and add a great accent color to the exterior. As you can see in these photos, the awnings are custom fit to each window and for this location in St Pete, the awning colors and style fit into the architectural style beautifully. Along with landscaping, adding awnings are one of the most cost-effective way to upgrade the look of a building in a classic way that never goes out of style. This retail application is a great example of how a St Pete home or business can benefit from the addition of fabric awnings. With a wide selection of awning fabric colors and an unlimited variety of welded aluminum awning frames, the design posibilities are endless. Most importantly, awnings pay for themselves over time by lowering Air Conditioning costs, especially on buildings that utilize a lot of windows for natural light. You can keep that beautiful natural lighting without turning your structure into a sauna or greenhouse. By blocking the sun before it reaches the window, the glass remains cool and the heat passed to the interior airspace is greatly reduced. At West Coast Awnings, we have more than 50 years of experience in St Petersburg and all over Tampa Bay. If you need straightfoward advice on how to solve a sun shading or rain protection problem, give us a call for a FREE expert On-Site consultation.